BAIKONUR SPACE CENTER, Kazakhstan, June 14, 2017 (Roscosmos PR) — The launch vehicle (LV) Soyuz-2.1a with cargo spacecraft Progress МS-06 successfully lifted off from Baikonur Space Center at 12:20 MT. 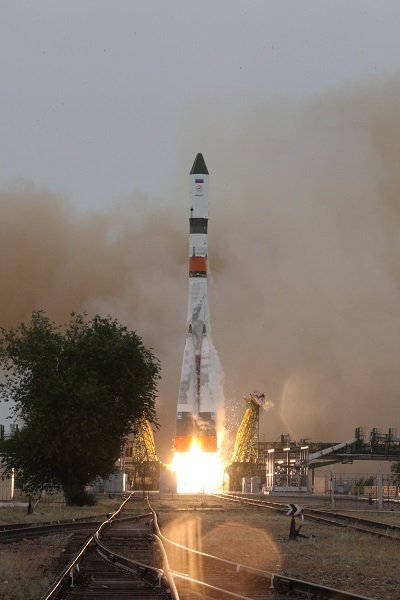 According the flight program, the first three stages of Soyuz-2.1a have taken the cargo spacecraft into low orbit just short of eight minutes and forty-eight seconds after liftoff. Korolev Mission Control Center specialists have taken the further Progress MS-06 flight to ISS under control. According to telemetry data, the spacecraft insertion into low-Earth orbit and separation from the third stage of the launch vehicle occurred on schedule, deployment of all antennas and solar array panels was detected immediately after the separation. Systems and assemblies of the spacecraft operate normally. The docking of Progress MS-06 to ISS module Zvezda is scheduled at 14:42 MT June 16, 2017. The ISS docking process will be in automatic mode under control of Russian ISS commander Feodor YURCHIKHIN and specialists of Russian ISS segment flight control group in Korolev MCC. The vehicle will deliver to the ISS about 2.5 tons of various cargo, including «dry» cargo, propellant in the combined propulsion system and refueling system tanks, water and compressed gases. I don’t care how old it is, the Soyuz is still a cool looking rocket.